Strolling mariachis and artwork by Hispanic artists from Arizona and New Mexico highlight this festive, casual and friendly annual marketplace, the largest of its kind in Arizona. Chat with more than 65 artists as they sell a range of distinctive and unique artwork. With art in every price range, Spanish Market offers buyers a wide selection of objects from different Hispanic traditions, including Santos, pottery, embroidery, furniture making, painting, printmaking, and silver and tinwork. Book signings take place in the museum’s Central Courtyard, where the Courtyard Café will offer a menu of festive and traditional foods. The Market is free with a suggested donation of $10, which includes museum admission. Inter-Tribal Council of Arizona, 2214 N. Central Ave.
DWL Architects, 2333 N. Central Ave.
Doxa Central Plaza, 2005 N. Central Ave.
U.S. Immigration & Customs Enforcement (ICE), 2035 N. Central Ave.
Brookstone office building, 2025 N. Third St.
Central Park Square, 2020 N. Central Ave.
Spanish Market: Mercado de las Artes parking is available at the University Club of Phoenix, 39 E. Monte Vista Road, ONLY on Sunday, Nov. 9. This year’s Spanish Market’s Featured Artist is Dr. Isabelle Collins (Hispanic) of Puebla, Mexico. 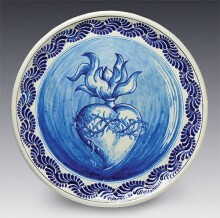 Collins is a renowned artist and international lecturer on the dynamic history of Majolica and Talavera pottery from its origins in the 9th century through its introduction to Mexico in the 16th century, to the present production of handmade treasures using a 400-year-old technique. Her goal is to preserve the culture and beauty that is associated with colonial Mexican pottery. Stop in the Heard Museum Shop for More Artists! While at the Spanish Market, visit the Heard Museum Shop and visit with – and purchase from – even more artists! Michelle Tapia, jeweler and scrimshander, began making jewelry in 1992. Never having any formal art training, but always creative from a young age, she quickly learned silver and goldsmithing, lapidary, and the art of scrimshaw. Tapia’s line has grown to include small and large devotional pieces called “Relicarios,” or images of Catholic saints, and Tibetan Buddhist deities; “Los Muertas Bonitas,” a whimsical line of beautiful girly skulls, sinister and handsome boy skulls with a touch of humor; and many other features. She only uses fossilized walrus tusk or tagua nut, never elephant ivory, or fresh walrus tusk. Lydia Quezada Celado de Talavera is the youngest sister of the renowned Juan Quezada of Mata, Ortiz, Chihuahua (featured in the book, The Great Masters of Mexican Folk Art.) Her husband Rito is an expert at firing the incredible thin-walled pottery made so famous by Juan Quezada. 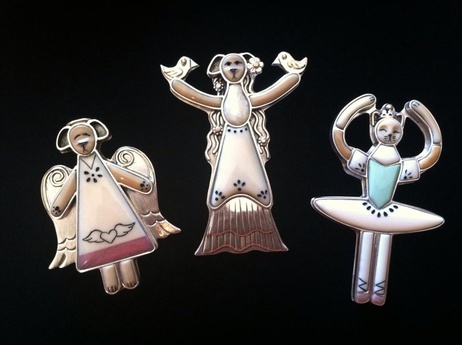 Lawrence Baca is a multi-talented, award winning jewelry designer, born and raised in Santa Fe, New Mexico. His design inspiration is defined by strong Hispanic and Native American cultural influences. The common theme in all his work is a combination of Spanish Colonial Ecclesiastical with roots in the earliest phase of Native American old pawn. 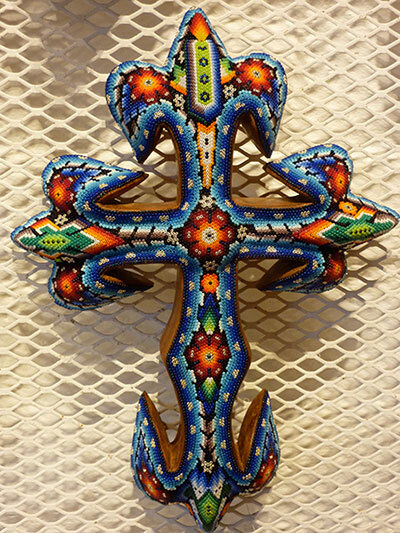 Huichol beaded art will be shown as a special exhibit in the shop during Spanish Market. This collection is the result of a 25-year-old collaboration between two North Americans and various Huichol artists. Judith Anderson and Jesse Hendry have for years been supplying Huichol artists with special carvings and 42 colors of Czech glass seed beads that are four sizes smaller than those beads available in Mexico. Their stated goal is to help present a higher quality of Huichol art and to increase the public’s appreciation for this beautiful art form thereby creating a broader international market so more Huichol artists can make a living and stay integrated with their native land and culture. Albert Monreal Quihuis, author of Isabela’s Treasure and several other children’s books, will be signing books from 11:30 a.m. until 3 p.m. Saturday and Sunday, outside Books & More. Albert is a native of Arizona, a father of four, and a certified financial planner for the Phoenix area. His goal in writing his books is to help teach other children about the life lessons and principles he has taught to his own children.